Thank you for being accommodating to us during our stay. You guys were great. When I return to Maine I will use the Cottage Connection for guidance. I really enjoy getting back to Maine and will return soon. Thank you so much for a wonderful vacation and who ever scheduled the weather, I appreciate the effort to the higher authority. We chose Cottage Connection for the simplicity of booking the home and the easily navigable website. We would definitely recommend Cottage Connection for the ease of booking our stay and the many locations and variety of homes to choose from. We had a great experience. We chose Cottage Connection because they were in the right location and large enough (the house) to accommodate us all. We thought your service was excellent. We have had our family reunions all over the country and this was the best. We are definitely going to recommend you to friends and family, as you just work very well for large groups. The biggest and best surprise was how easily everything flowed for our multigenerational reunion. We ranged in age from 6 months to 73 years and we all had a blast! Great home, very nice amenities, activities for all ages. Room enough for us all to be together or to find our own space! Our reservation with a VRBO fell through at the last minute. We walked into the welcome center of Cottage Connection hoping that they may be able to help up locate a cottage without ANY prior reservation and so last minute. Fortunately, Fairview was just coming on line and had open availability! How lucky for us. So pleased that we were the first guests at Fairview. We enjoyed our vacation here immensely, such a lovely spot with a great view. Thanks so much. 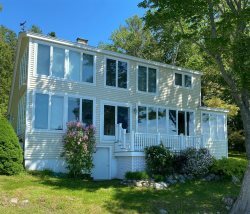 bringfido.com referred us to Cottage Connection of Maine as we were looking for pet friendly properties. We found Cottage Connection web site easy to view and book on line. We chose Blackberry Cove primarily for its private beach. We enjoyed our stay so much, we are coming back in the fall. Kayaks at the cottage for guests use makes its so much easier as well. These folks at Cottage Connection are so friendly and helpful, you would never want to be anywhere else. Service was great!! We saw The Nest on line and like the property and price. We felt like we were home - the cottage was comfortable and welcoming.